Anyway, as I am now an Asda comvertee, I had a good look at some of their Christmas offerings, (I am actually eating most of it as I am writing this post and am not ashamed to say that!). First up, take a look and weep at the whole selection of stuff I was kindly sent by the lovely Lucie. I was really impressed to see those stencils that people hold over pies and drinks to make special pictures (I have no idea what the official name is for these things but I have ALWAYS wanted one.) 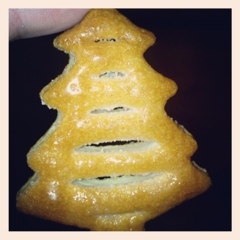 so this basically means that I can make pretty patterns on my mince pies now! 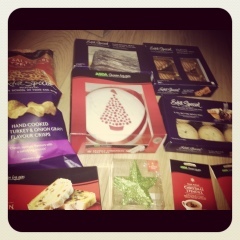 My Asda Christmas Goodie Selection! I also love these cool sweety reindeer and santa lollies which would be great for a stocking filler. I am ashamed to say I did not offer any of this to my children, yum. They have a sort of marshamallowy feel that I loved. 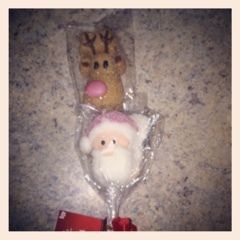 Santa and Reindeer Sweety Lolly. 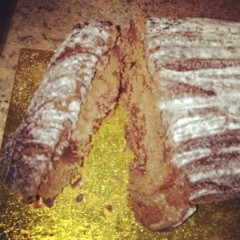 I'll write another post soon on the progress of the Christmas food, it's going to be emotional. Maybe Christmas isn't so bad after all!